Anglers who braved the chilly, drizzly, dreary days that made up the early part of the week were rewarded with a hot bite – and it shows no signs of stopping now that the mercury has risen. “Bass and blues in the surf, with still some slammer blues roaming the bay,” said a fishing report from The Dock Outfitters in Seaside Heights. Customer Nick Kube last night landed a 40-inch 13-pound bluefish from the end of the store’s dock using cut baitfish – his 88th fish of the season. Another angler, a Tony Maja rep, landed a 53-pound cow from a boat, which was released to fight another day. While blues and stripers are largely remaining the targets of surf anglers, there are some good reports on fluke despite low participation given the weather. Keeper summer flounder were landed in the usual spots on Barnegat Bay – the BI and BB buoys, as well as in the Manasquan River along the channel edges. Thus far, the river has been the hot spot, with many anglers reporting keepers. If you’re heading out this weekend, check out the channel edges from Clark’s Landing Marina, all the way out towards the inlet. The area near the Route 35 bridge has always been my favorite, but if boat traffic isn’t too heavy, use your fishfinder to locate some muscle beds closer to the inlet near the sand bars and (carefully) drift over top to find your dinner. Keepers have been a bit harder to come by in the ocean, but that is par for the course this early in the season. But if the ocean is calling your name, you probably won’t be disappointed. There are some fluke out there at the reefs, but sea bass fishing has been on fire. The regulations give you until June 18 to catch sea bass. You’re allowed 10 fish at 12.5 inches before the season closes and then quickly reopens with just a 2-fish limit. For back bay boaters, blues are still schooling near the Route 37 and Mantoloking bridges. Anglers this week found success using both bait and artificials, though some said shiny metal lures or poppers were the best bet to find blues. 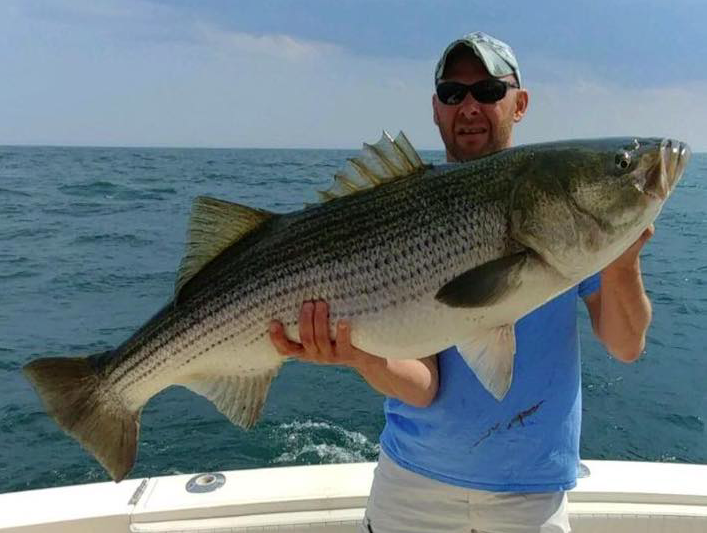 “Cocktail size blues in the Toms River along with short bass hitting small swimmers and swim shads,” a report from Murphy’s Hook House in Toms River said. Weakfish also started to appear, according to the folks at the shop. Surf anglers were finding more success with bait than artificials, according to the crew at Grumpy’s Tackle in Seaside Park. Customers of the shop said bunker chunks and clams were the ticket, and more fish were being caught during the evening hours than any other time of day. As always, we encourage everyone to send us their catch photos all season long, and we’ll happily include them in this column. Send them to daniel@shorebeat.com any time!